“With a torch in my hand, the light of which is not by any means a flickering one, I illuminate this underworld of ideals with beams that pierce the gloom.” – Nietzsche, Ecce Homo. The best bait, as huntsmen and fishermen require it. For if the world be as a gloomy forest of animals, and a pleasure-ground for all wild huntsmen, it seemeth to me rather – and preferably – a fathomless, rich sea; – A sea full of many-hued fishes and crabs, for which even the gods might long, and might be tempted to become fishers in it, and casters of nets, – so rich is the world in wonderful things, great and small! Especially the human world, the human sea: – towards it do I now throw out my golden angle-rod and say: Open up, thou human abyss! In the first chapter of Zarathustra, “The Higher Man” the speaker and sage of the text contemplates the fate of mankind and his predicament in his dwelling place on a mountain. Altered is Zarathustra; a child hath Zarathustra become; an awakened one is Zarathustra: what wilt thou do in the land of the sleepers? The Atman personified subsequently decides to descend from a mountain after 10 years of meditation and down into the market place of the mob to proclaim the truths that he discovered out of his own innate altruism and compassion to his fellow man. To his dismay, he realizes he spoke too soon when his words fall upon dead ears from those in the market place and even spurns his attempts to proclaim the gospel of the higher man in mockery and scorn in order to maintain their mediocre status-quo. “You higher men,” — so sputters the crowd — “there are no higher men, we are all equal; man is man, before God — we are all equal!” Before God! — Now, however, this God has died. Before the crowd, however, we will not be equal. You higher men, go away from the market-place! Lo, I teach you the Superman! The Superman is the meaning of the earth. Let your will say: The Superman shall he the meaning of the earth! I conjure you, my brethren, remain true to the earth, and believe not those who speak unto you of superearthly hopes! Poisoners are they, whether they know it or not. Despisers of life are they, decaying ones and poisoned ones themselves, of whom the earth is weary: so away with them! Once blasphemy against God was the greatest blasphemy; but God died, and therewith also those blasphemers. To blaspheme the earth is now the dreadfulest sin, and to rate the heart of the unknowable higher than the meaning of the earth! There abides for ever the one unborn in the secret place within the body. The earth is his body; he moves through the earth but the earth knows him not. The waters are his body, but the waters know him not. Light is his body, he moves through the light but the light knows him not. Air is his body, he moves through the air but the air knows him not. Ether is his body, he moves through the ether but ether knows him not…Thinking mind is his body, he moves through thinking mind but thinking mind knows him not. He alone is the indwelling spirit of all beings, free from all evil, the one divine, radiant Narayana. …the hypnotic feeling of nothingness, the silence of the deepest sleep, in short, the loss of suffering – something which suffering and fundamentally disgruntled people have to consider their highest good, their value of values, and which they must appraise as positive and experience as the positive in itself. (With the same logic of feeling, in all pessimistic religions nothingness is called God). It seems as though Nietzsche had adopted the concept of reincarnation for his philosophy. Nietzsche’s connection to Asian religion and philosophy started with Paul Deussen aka “Deva-Sena” (a name he adopted for his admiration for the Hindu religion), a German Sanskrit scholar, something of which Nietzsche acknowledges in his works. In the Advaita Vedanta teaching, it posits that there is an eternal, emantative and incomprehensible spirit beyond the material universe yet imminent in the life-process as an energizing principle. As follows, every sentient being is a unique manifestation of this ineffable force or principle, in which the world of appearances makes this realization difficult to realize that we are identical to the Supreme Spirit, since the cosmos is marked in terms of separation, illusion and duality under the umbrella of Maya. The Atman thus returns to the Ultimate Reality as the pinnacle of its spiritual journey through direct experience via the dissolution of form and into the unborn. It is this viewpoint that Nietzsche contends with in that he categorically rejects the idea of the world of appearances as the shadow of a noumenal world as promoted by the likes of Plato in the Theory of Forms of his dialogue Phaedo, the Gnostics and the Hindu mystics as a pursuit of a metaphysical fancy. Buddhism is a hundred times as realistic as Christianity — it is part of its living heritage that it is able to face problems objectively and coolly; it is the product of long centuries of philosophical speculation. The concept, “god,” was already disposed of before it appeared. Buddhism is the only genuinely positive religion to be encountered in history, and this applies even to its epistemology (which is a strict phenomenalism) — It does not speak of a “struggle with sin,” but, yielding to reality, of the “struggle with suffering.” Sharply differentiating itself from Christianity, it puts the self-deception that lies in moral concepts be hind it; it is, in my phrase, beyond good and evil. To Nietzsche, the Buddha offered a far more realistic and approachable path for spiritual practitioners, that was leavened with reason and moderation in light of the Middle Way to liberation without all the extreme bodily mortification prevalent in asceticism of the Yogi’s (for example) or abstaining from addictive sense pleasures and vices of all stripes. Buddhism, I repeat, is a hundred times more austere, more honest, more objective. It no longer has to justify its pains, its susceptibility to suffering, by interpreting these things in terms of sin — it simply says, as it simply thinks, “I suffer.” To the barbarian, however, suffering in itself is scarcely understandable: what he needs, first of all, is an explanation as to why he suffers. (His mere instinct prompts him to deny his suffering altogether, or to endure it in silence.) Here the word “devil” was a blessing: man had to have an omnipotent and terrible enemy — there was no need to be ashamed of suffering at the hands of such an enemy. While he has a reasonably favorable view of Buddhism in comparison to other more decidedly theistic religions, he however dislikes its evaluation of suffering as a category definition of the world, thus weakening and even negating the Will to Power, instead of fortifying it. To Nietzsche, the weak man dwelt in his own miserable state, picking his mind with festering thoughts of jealously and inferiority while placing blame on others. It is this slave morality that denounces power and happiness while promsing the weak will receive eternal bliss in the afterlife. Yet, Nietzsche had also rejected the idea that mankind was guilty and responsible for everything inherently wrong in the world because this shifting of responsibility from God to man is false though it reverses the direction of the resentment and might serve as a catalyst to personal development. This world, the eternally imperfect, an eternal contradiction’s image and imperfect image- an intoxicating joy to its imperfect creator:- thus did the world once seem to me. 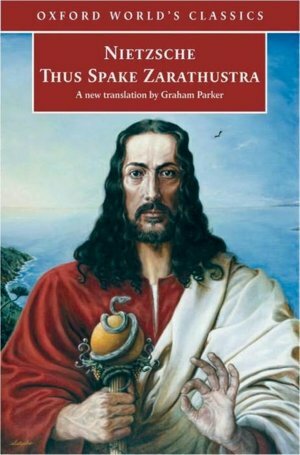 It is here that Zarathustra paradoxically shares the pessimistic anthropological attitude of the ancient Gnostics such as the Sethians who disregarded the world and its creator as an abortive mistake to be repudiated and transcended. They believed that the creator god was by no means a universal one, but a secondary, subordinate god, angel or even a malicious demon empowered with the ability to craft and construct. It is this being who in his vanity created the world and cosmos in which he was satisfied this work was good and perfect, but in reality was a sham in which its iron manacles kept the inner luminary of man captive to the realm of fate, similarly to the idea of Eternal Recurrence. Yet, he was admonished by his own Mother of the Angels (Sophia) for being opaque and blind. The human being, accordingly is really a spirit entrapped in the tomb that is bodily flesh, like a pearl buried in mud. Both the world of humanity and the world of the cosmos at large are battlegrounds in a war between good spirit of light and the malevolent, counterfeit spirit that rules over matter. Man was originally pure spirit or consciousness, but somehow in the process of emanation and creation, man had become entrapped by the evil eon to the shackles of the cave-world Plato described in his famous Cave allegory. The human race experiences this reality in whatever he projects from his own consciousness but is really a sort of malevolent simulacrum, a matrix-like “time out of joint” as Shakespeare’s Hamlet put it. In this Gnostic revelation, the pre-cosmic fall of being from the world of light leading to the creation of an evil, prison-like world made by a stupid and inferior creator becomes the center stage of this unfolding, divine drama. Whether or not, Nietzsche was familiar with the doctrines of the Gnostics (probably not), he definetly shares a similar attitude as expressed earlier on, despite his insistence on laying a hold of the beauty in the gloomy cosmos as a thriving and independent isle of virtuous light and power that transcends the dichotomy of good and evil. The Gnostic acosmic denial of existence would have turned him off, however. Companions the creator seeks, not corpses, not herds and believers. Fellow creators the creator seeks — those who write new values on new tablets. 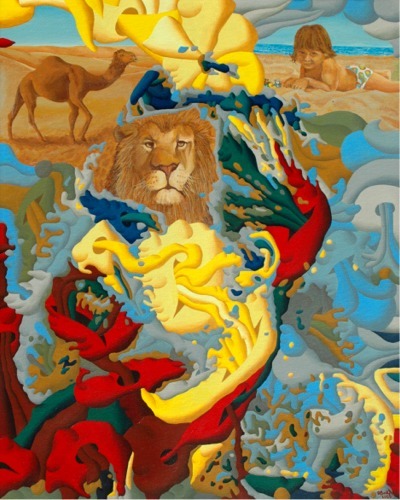 THREE metamorphoses of the spirit do I designate to you: how the spirit becometh a camel, the camel a lion, and the lion at last a child. Many heavy things are there for the spirit, the strong load-bearing spirit in which reverence dwelleth: for the heavy and the heaviest longeth its strength. Innocence is the child, and forgetfulness, a new beginning, a game, a self-rolling wheel, a first movement, a holy Yea. Aye, for the game of creating, my brethren, there is needed a holy. Yea unto life: its own will, willeth now the spirit; his own world winneth the world’s outcast. I take that in light of what Nietzsche wrote about when the highest values have become devalued, a new system of values needs to be created. The Übermensch must first grow in the wilderness of past mythology and metaphysics, then he must surpass those “lying specters of the ages” and forge his own destiny by staying truthful to his virtues midst the drowning miasma and noise of the herd. Nietzsche correctly understood that fixed values of the old religions and sciences weren’t not enough to make humans reach their optimal state. They would need an intelligent utilitarian will, an executive power which transcends moral law and seeks the most highly beneficial outcome in circumstances which the virtues and laws of the common man could not properly address. A genuine measure of individual sovereignty or autonomy and self-mastery becomes the laid foundation for this “higher” type of human being, transcending “beyond good and evil” and attaining a higher calling or spirituality. This philosophy does not call for the eradication or repression of ones most innate and basic drives with which humanity is endowed, but rather they are sublimated into a flouring vitality. It supplies the impetus to all higher spirituality and culture, through which alone human life can transform itself into something worthy of esteem. This new set of values provides the means to emerge to a higher platform of vision and being, transcending the brutish nihilism that is left from a disbelieving herd or mass of people who have resigned themselves to an unsatisfactory life of mediocrity and conformity. Nietzsche’s characterization of the general idea of an objective truth as a kind of error, and knowledge as a kind of fiction also becomes notable, at last in relation to the traditional model of truth as the process correspondence of thought to being, and of knowledge as justified true belief. This in his view is a myth. All truth expressed by a human has a relational or relativistic character that requires to be understood differently and is purely subjective in perspective. So, what does that say about Zarathustra who ministers and proclaims his existential truths to the mob? …The “Will of God” means the “Counsel of God,” and entity which is distinct from both Nature and the Word and which mediates between God and the material world, at once unnecessarily complicates the cosmogony and really makes the Will equivalent to the Word. The “kingdom of heaven” is a state of the heart—not something that is to come “above the earth” or “after death.” The whole concept of natural death is lacking in the evangel: death is no bridge, no transition; it is lacking because it belongs to a wholly different, merely apparent world, useful only insofar as it furnishes signs. The “hour of death” is no Christian conception: “hour,” time, physical life and its crises do not even exist for the teacher of the “glad tidings.” The “kingdom of God” is nothing that one expects; it has no yesterday and no day after tomorrow, it will not come in “a thousand years”—it is an experience of the heart; it is everywhere, it is nowhere. A revaluation of all values: this question mark, so black, so huge that it casts a shadow over the man who puts it down — such a destiny of a task compels one to run into the sunlight at every opportunity to shake off a heavy, all-too-heavy seriousness. Even the Übermensch must laugh and crack jokes every now and then, which ultimately reflects Nietzsche’s attitude towards life and oneself on the journey towards ascending the golden starecase of self-mastery and into the light of self-possessed being. It is laughter which demonstrates the capacity in taking command of one’s self and the heights of the soul because it is capable of affirming life for what it is, in the here and the present. It is only in the present that the higher man can flourish. My wise longing cried and laughed thus out of me – born in the mountains, verily, a wild wisdom – my great broad-winged longing! And often it swept me away and up and far, in the middle of my laughter; and I flew quivering, an arrow, through sun-drunken delight, away to distant futures which no dream had yet seen.